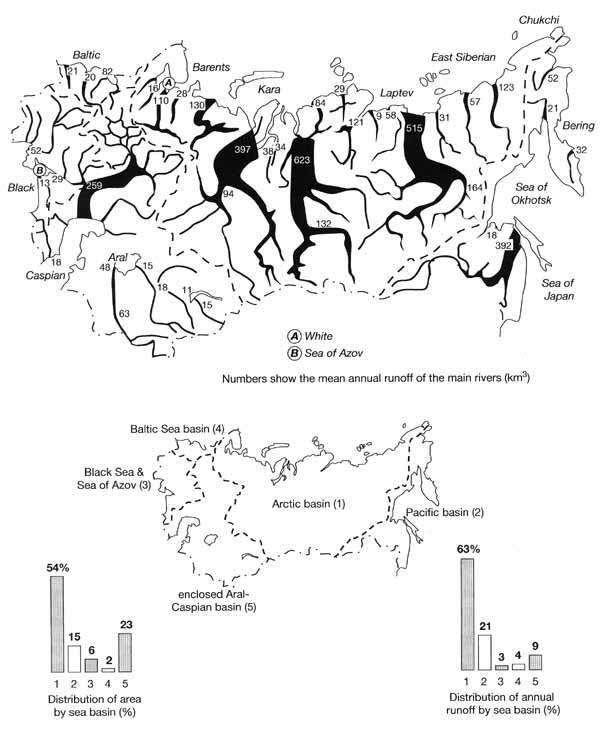 Northern Eurasia is surrounded by fourteen seas (Figure 5.1) with a combined area of about 11 million km2 (see Avakyan and Shirokov, 1994). Seas of the Arctic and Pacific Oceans are discussed below while other volumes of this series are concerned with the Baltic. This chapter discusses the Black Sea and Sea of Azov which occur far inland and have limited connection with the World Ocean. The Black Sea is connected with the Sea of Marmara and the Mediterranean only through the narrow (0.76-3.6 km wide) and shallow (32-34 m deep at the junction with the Sea of Marmara) Bosporus Strait. The Sea of Azov is connected to the Black Sea by the shallow Kerch Strait and is often regarded as a gulf of the Black Sea. The Black Sea is the world's largest permanently anoxic basin. Understanding of its unique environment is extremely important, first, because it may provide insight into the past conditions in the World Ocean and second, because the oxic-anoxic interface may be sensitive to changes in the water balance of the sea with potentially damaging consequences. Anoxic conditions develop in response to a specific water balance of the Black Sea and the exchange with the Mediterranean. Salinity of the mixed surface layer in the Black Sea is low, about 18 ppt, because the sea receives relatively high precipitation and river inflow while evaporation is relatively low (Table 5.8). Table 5.8 Components of the water balance of the Caspian Sea between 1900 and 1985. Source: Kosarev and Makarova (1988). Water of the upper layer flows from the Black Sea to the Sea of Marmara through the Bosporus Strait while a more dense and saline (about 35 ppt) water of Mediterranean origin flows in the opposite direction at lower levels. Strong salinity stratification and weak vertical water exchange develop, preventing ventilation of the deep water whose oxygen content is exhausted through the decay of the settling organic material. Oxidation under anaerobic conditions occurs using the oxygen of sulphate ions and the water becomes enriched in hydrogen sulphide (H2S). The major supply of hydrogen ions is through the dissociation of carbonic acid. The sea, therefore, is stratified into two distinct zones: the upper oxygenated layer which extends to a depth of 100-200 m and the deep anoxic layer where oxygen is replaced by H2S (Figure 5.11). Already at a depth of approximately 300 m, oxygen is found to be depleted to zero concentrations while H2S builds up. A steep pycnocline, which occurs between the two zones, provides a barrier to mixing and maintains the stability of the oxic-anoxic boundary. The change from oxic to anoxic conditions in the Black Sea occurred about the time of the postglacial climatic optimum when a rise in the level of the Mediterranean restored the inflow of saline water (Deuser, 1972; Ross and Degens, 1974). The topography of the boundary between the oxic and anoxic waters is the most important control over life in the Black Sea. It is not surprising, therefore, that a possible rise of the boundary remains a central question in research on the Black Sea environment. The position of the oxic-anoxic interface depends mainly on the salinity profile and may be sensitive to changes in the water balance of the sea. Although this is a controversial issue, it is not inconceivable that changes in the water balance may lead to a rise of the H2S zone. Such changes may occur as a result of natural climatic variability, global warming, and human interference. In particular, there is a concern over potential effects of the water abstraction which in the mid-1980s reached 10 per cent of the total river inflow (Zhorov et al., 1984; Zhorov and Boguslavsky, 1985; Faschuk and Ayzatullin, 1986; Bryantsev et al., 1988; Murray et al., 1989). At present, there is no definite concept of the H2S zone dynamics, partly because the historical information is either lacking or is insufficiently accurate, and partly because there are distinct seasonal fluctuations which depend upon both circulation and biotic factors (Mandych et al., 1995). A comparison between the measurements made in the 1960s and the late 1980s suggests that there has been only a marginal change in the depth of the H2S boundary (Codispoti et al., 1991). Spatial patterns of the oxic-anoxic interface and seasonal variability in its depth are better researched. 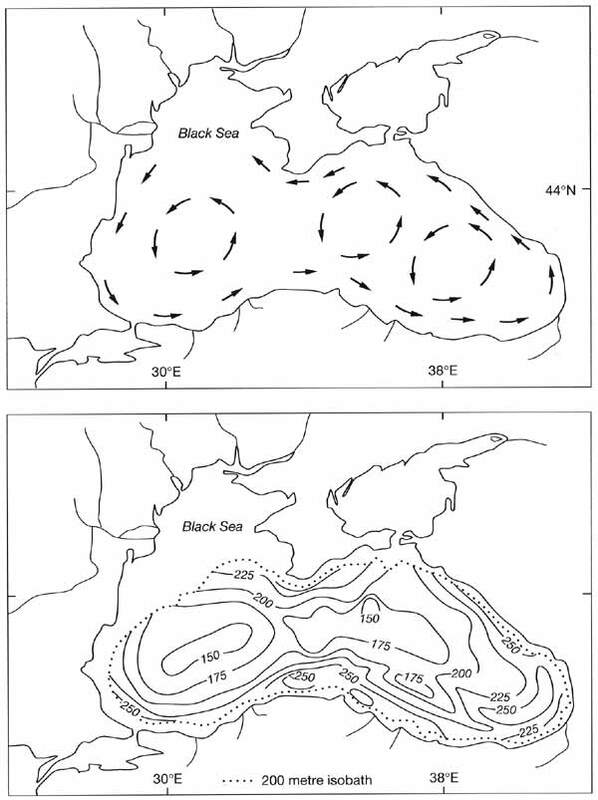 The water circulation system in the Black Sea consists of large closed cyclonic gyres which form inside the Main Black Sea current (Figure 5.11). There are also smaller anticyclonic eddies developing between the coast and the Main current, which runs at a distance of 20-30 km from the shore. It is known that the depth of the H2S boundary may vary by about 100 m in the centres of cyclonic and anticyclonic gyres (Sorokin, 1983; Mandych et al., 1995). The maximum depth occurs in the centre of an anticyclonic eddy in the south-eastern sector of the sea while the minimum depth occurs near the centres of the cyclonic eddies (Figure 5.11). In winter and late autumn, a decline in the depth of the boundary is observed in contrast to spring and summer. Seasonal fluctuations apparently result from an increase in oxygen solubility and a decrease in the rates of organic matter destruction during the cold season as well as from stronger water dynamics which intensify the aeration (Sorokin, 1983; Mandych et al., 1995). Heavy pollution of the coastal waters by organic compounds and eutrophication have a detrimental effect on the oxygen regime of the sea. The northwestern part of the basin is under the strongest pressure because it receives about 80 per cent of the total river runoff (from the major industrial and agricultural regions), and because of the impact of the largest ports of Odessa and Novorossiisk. In recent years, the beaches of the western Black Sea were repeatedly 'closed' by the sanitary inspectorate and the state of the coastal environment is considered as critical. Pollution has had a strong impact on the population of dolphins, which has declined from 2-2.5 million in the 1930s to about 100 000 in the late 1980s, despite all attempts to protect this species (Kuksa, 1994). In its natural condition, the Sea of Azov was one of the most productive water bodies in Northern Eurasia. Because of the ample river runoff (mainly from the Don and the Kuban) there was a stable supply of a large amount of nutrients. Water had a low salinity (about 10 ppt prior to intensive changes in river runoff with the exception of the Gulf of Sivash), the sea was well heated and, with an average depth of 7 m, it was well illuminated. The productivity of the sea reached 8 tonnes km-2 (Bronfman, 1995) and until the 1950s the fish productivity of the sea was above 0.2 million tonnes per annum (Ratkovich, 1993). However, because the sea regime is primarily controlled by river runoff and the water exchange with the Black Sea is restricted, the Sea of Azov ecosystem proved extremely sensitive to human impacts. The sea receives runoff from a vast economically developed catchment, which is nineteen times larger than the area of the sea, and river discharge is equivalent to 13 per cent of the sea volume, which is much higher than for other seas. At the end of the 1980s, this region produced 22 per cent of the agricultural products and 17 per cent of the industrial goods of the FSU, including 30 per cent of its coal, 25 per cent of its steel, and 15 per cent of its mineral fertilizers and plastics (Bronfman, 1995). Over 50 per cent of river runoff was used by industry and over 70 per cent of the catchment was under agricultural production, which significantly modified the chemical composition of the water. The hydraulic developments on the tributaries (in particular, the Tsimlyansky reservoir constructed on the Don in 1953) and irreversible water abstraction, which reached 20 per cent of the annual runoff, reduced river inflow by 33 per cent to 13.5 km3 a-1 (Bronfman and Khlebnikov, 1985). As a result, the chemical class of water changed from the hydrocarbonate class of the calcium group to the chloride-sulphate class of the sodium group. Salinity increased to 14.0-14.5 ppt in the early 1970s, which was a period of low precipitation and it was the onset of a phase of high precipitation in 1977 that helped to stabilize salinity at 11.2-11.9 ppt (Bronfman, 1995). Pollution (including pesticides) and an increase in salinity were the major factors behind a dramatic decline in fish stocks. Out of 114 fish species and subspecies, 42 are fresh-water species whose area of habitat has been sharply reduced. In addition, the reduction in spring floods due to the regulation of runoff has affected spawning grounds of diadromous and semi-diadromous fish and the existence of sturgeon in the Sea of Azov at present is almost entirely due to the fish farms. During the period of high salinity in the mid-1970s, some Black Sea species migrated to the Sea of Azov. In particular, outbursts of the jellyfish population occurred, with its total mass reaching 13.5 million tonnes (Kuksa, 1994), which significantly reduced the biomass of the other species. From the late 1980s, the predatory Atlantic ctenophore (Mnemiopsis leidyi), which is known to consume over 80 per cent of the summer production of zooplankton, has developed in the sea. It is believed that if M. leidyi becomes a permanent element of the Sea of Azov ecosystem, a recovery of the ecosystem will be unlikely.